Eclectic all-season groove band. Think: Phish, String Cheese Incident or The Grateful Dead. 4. Why Did you Do Me Wrong? Smokestack is a powerful improvisational groove quartet hailing from Ann Arbor, Michigan. Smokestack's members have studied music at the collegiate level, playing in both the University of Michigan and Detroit's Wayne State University jazz big bands and small group ensembles. Since their formation in 1998, Smokestack has performed with national acts such as the Jerry Garcia Band, The Slip, Strangefolk, Umphrey's McGee, Larry McCray, and Howie Day. 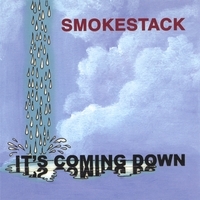 Smokestack's 2001 independent album release entitled "It's Coming Down" provides listeners with an eclectic mix of original songs. With a sound that mixes jazz, funk, Latin, reggae, rock and bluegrass, Smokestack has quickly gained a respectable following in the mid-west area. Performing 80+ shows this past year alone, Smokestack will continue to impress diverse audiences with their unique improvisational abilities. earbuzz.com review of track 1: "A Leg and a Foot" Smokestack's latest CD, "It's Coming Down", opens with the Calypso upbeat funk tune, 'Leg and Foot'. The happy perpetually moving pop beauty combines some of the hippest and tightest rhythm section to grace this genre of music. Dan Eichinger's abilities on the skins are reminiscent of Bonham and Hakim - with a pulse that bleeds through the track and fills that inspire. The song itself, words, music, are memorable - a lyrical chronicle of a meeting with a mystically wise woman named Rosalee..
'so i took to the streets, and i met a girl named Rosalee... and this is what she said to me, you can always go your own way, but you can't be gone too long. next time you go to the ocean, next time you go to the sea, listen for all the music, and someday you'll find Rosalee'. The seven minute tune is a free form pop structure that includes stretched breaks for guitarist, Chuck Newsome, whose clean Knopfleresque tone is perfectly matched to the Caribbean Latin flavors that flow throughout. The four piece band lists three members with vocal credits - so we're not sure who's singing - but whomever it is - the tone is easy and accessible - tell tale story with crisp intonation and warmth. Great tune - and you know.... because before you start looking at your clock to see if the seven minutes is up. From the first track "Leg and a Foot" with it's upbeat caribbean patio party feel to "Send My Regards" with a country boogie flavor and organ jazz of "Beaver Street", this cd does not disappoint. Yes, the Phish comparison is made, but only because of the musicianship that's involved. Smokestack stands on it's own. With a touch of some early Medeski, Martin & Wood, Jimmy Smith and Paul Cebar & the Milwaukeeans, you got yourself a real good time! Smokestack's album, It's Coming Down, starts off with a smooth tropical sounding riff and continues to provide catchy an eclectic blend of music throughout. The musicianship is very professional and the songs are easy to sing along to. Reminiscent of other jam bands like Phish and String Cheese Incident. Nice, easy-flowing sound. Smokestack's debut release It's Coming Down shines with maturity beyond the years of the musicians who recorded it. One standout member on the CD is Bassist Thom McNeil, affectionately called T-BASS by the rest of the band. T grooves like a wet fish and adds a chiseled jaw bone to the record. The other members follow BASS throughout the 10 tracks and land with the sure feet of a feline on the final notes of Bakersville. Buy the album before it goes out of print!!! First saw you in Montague,MI at the band shell. You were sold out of CD's by the time we made it back stage. Until I could order on line you gave me a promotional copy (which I passed around to my friends) We all loved it. We are hoping to be able to attend another event in MI-either Kalamazoo or Mt Pleasant. Looking forward to seeing you again soon. Buy this CD NOW!!! You won't regret it! This CD is jazzy, jammy, funky FUN! I saw the band in Mt. Pleasant, and simply had to get my hands on a CD, and thankfully I found all of my favorite songs heard that night on this CD. The songs are fun and catchy, and after several months in my CD rotation it's still not getting stale to my ears, which is hard to find these days. Awesome! If you like Phish, Umphreys, and String Cheese, you will love this band! They have elements of Jazz, latin, rock, and carribean. They are a great jam band!